It’s a holiday weekend, hooray! I hope everyone has had a most excellent Thanksgiving. I thought for a holiday weekend treat, we’d do something fun here today, so I asked a couple of authors to participate in an interview just for ALSC and YALSA blog readers! The two authors I asked to participate have something in common: they write both middle grade and young adult books. As a librarian who works with all ages, and especially with the “tween” ages (where ALSC and YALSA’s services overlap! ), I find myself needing to be familiar with both types of books. The exact definitions of Middle Grade and Young Adult are subjective and amorphous. For the purposes of this post, we’ll just say that the intended audience for middle grade is slightly younger than the intended audience of YA, but both can be enjoyed by all ages. 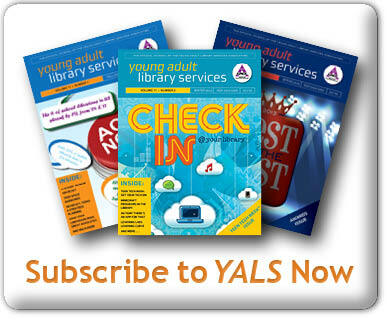 Submit your summer reading program for YALSA’s new book! By Stephanie Kuenn March 30, 2011 March 30, 2011 YALSA Info. 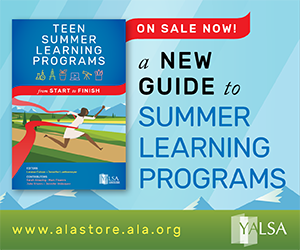 YALSA is planning a new publication, YALSA’s Complete Summer Reading Program Manual for Teen and Tween Services. Kat Kan, the book’s editor, is looking for information on summer reading programs and the other kinds of programming libraries do for teens and tweens during the summer.’ Want more information or interested in submitting your summer reading program? Visit the book’s website! Tagged books, Summer Reading, YALSA Info. By Gretchen Kolderup October 26, 2010 November 10, 2011 Continuous Learning, YALSA Info. YALSA president-elect Sarah Flowers recently authored Young Adults Deserve the Best: YALSA’s Competencies in Action, which expands on YALSA’s competencies for librarians serving youth and gives practical advice and examples for fulfilling those competencies. Sarah was kind enough to answer a few questions about her new book. GK: You were on the taskforce that updated YALSA’s Competencies for Librarians Serving Youth. What were the most important things you wanted to see changed in the newest version? SF: I wasn’t on the Board when they decided that the Competencies needed to be updated, so I just tried to look at them with fresh eyes when I was appointed to the taskforce, and the other members did, too. We thought they were really good competencies, but we all began to notice that there were some repetitious parts, and we also thought that the language was perhaps a little too academic, so our goal was to streamline them. GK: What motivated you to not just serve on that taskforce, but to write this book as well? SF: Most of my library career has been spent as a manager. And as a manager, I tend to look at things in terms of: “How can I help librarians grow and get better at their jobs?” “What can I do (or provide) that will help these people develop and be better able to serve our population?” And the competencies fit that. They give a framework for growth and professional development. And in writing the book, I had a chance to really focus on how a front-line librarian (even one without a lot of administrative support) could grow and become a better YA librarian. GK: Looking over the list of competencies, the sheer number of qualities and areas of knowledge that librarians working with teens should have can feel overwhelming. What advice would you give someone for prioritizing the competencies and knowing which to focus on developing first? Is there one competency area that you think is the most important or that is essential to have to fulfill the others? SF: I think it depends on two things: what a specific librarian feels that he or she lacks, and what actually can be accomplished. Some things it’s really hard to do if there is no budget, or no support from library management. So you look at the whole thing, and work on the little pieces that you can manage. In terms of a most important area, I do think that Leadership and Professionalism are critical. I think that in a lot of ways they lead to all the others–especially in those situations when you’re on your own, without a lot of support. Be professional, be a leader, and you will be able to work toward achieving the other things. GK: In the book, you mention a few times that these competencies aren’t so much a list of qualities those in entry-level positions should have so much as a vision for YA services that librarians grow into throughout their careers. Which competencies do you think take the most effort or time to develop? SF: Again, it depends a lot on the individual, and their own gifts, talents, and background. Some people are natural advocates and communicators, so that part isn’t a problem for them, but maybe they have a tough time doing the administrative stuff. Others may be great at programming and services in the library, but shy about making the case for YA services to administration, or to elected officials, or even in doing outreach. GK: You’ve had an impressive career so far with your work in libraries as a YA librarian, adult and YA services supervisor, library manager, and most recently as the deputy county librarian for the Santa Clara County Library in California; your previous books and articles; and your recent election as the 2011-2012 president of YALSA. Are there competencies you still feel like you’re developing? SF: Oh, always! I think I am always working on being a better advocate for teens and teen services, and communicating their needs to the wider world. Also, because I jumped fairly early into management-level positions, I never felt like I had a chance to develop skills in programming for teens, so I’m really in awe of some of my YALSA colleagues who have been able to create terrific programs with and for teens. GK: What do you think the biggest hurdle is in providing quality services to teens, and how can a librarian who may be working with a small budget or working in a department of one do to overcome that hurdle? SF: I think lots of times it’s just inertia or lack of knowledge: “we’ve never done this before and we don’t know how and we don’t know why it’s important.” But I think attitude is key. And that’s where leadership and professionalism come in. If you can take your enthusiasm for serving teens and your knowledge of their needs and desires, and convince others on your library staff that services for teens are important, you can overcome any hurdle. It won’t necessarily be quick or easy, but there are plenty of success stories out there. 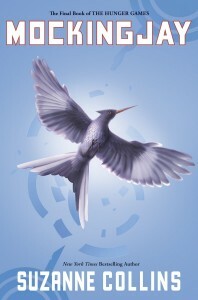 Next week, this summer’s biggest book release,Mockingjay, the final installment of The Hunger Games trilogy will arrive. Are you prepared?’ I’m pretty excited.’ Click through and I’ll tell you all about it. 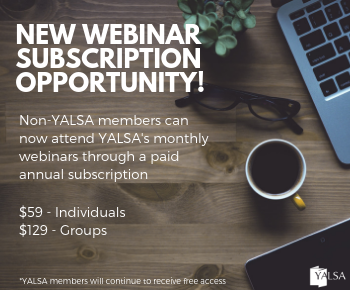 Save $10 on next Thursday’s webinar If you register for YALSA’s Risky Business webinar by July 14, , taking place next Thursday at 2 p.m. Eastern, you’ll save $10 over normal registration rates. That means the webinar is just $29 for individual YALSA members and $39 for all other individuals. Register today at www.ala.org/yalsa/webinars. WrestleMania: We’ve made the Challenge shorter and simple. The WrestleMania Reading Challenge has changed this year to take place during just one week, making it simpler for you and your teens and tweens to particpate. Registering automatically enters you into a drawing for one of five sets of books from Penguin â€” and it gives teens and tweens at your library the chance to win tickets to WrestleMania and $2,000 for your library. It’s a surefire way to get new YA readers into your library. Don’t believe us? Then find out what happened at Bambi Mansfield’s library.’ Register today at www.ala.org/wrestlemania. Win cold, hard cash from YALSA. Do you have an idea to make YALSA’s awards and booklists into household names, ensure young adult and school librarians have access to important research, help YALSA better advocate for quality library services for every teen in every library, develop continuing education or career services that librarians need or engage YALSA’s current membership and recruit new members? Of course you do. Well, YALSA will pay you $250 for that great idea (and YALSA committees are eligible to submit an idea, too). But you have to submit your idea to the Great Ideas contest by July 15. 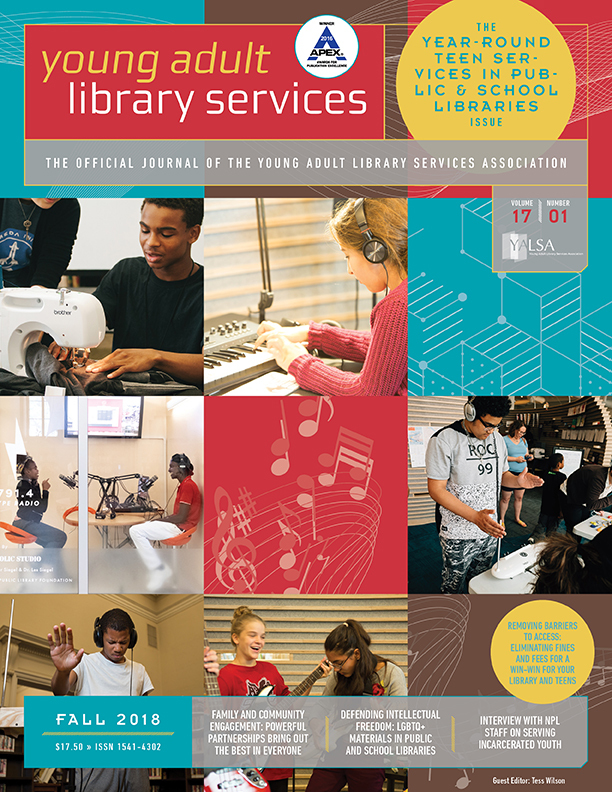 New Books from YALSA Now available in the ALA Online Store: Risky Business: Taking and Managing Risks in Library Services to Teens by Linda Braun, Hillias J. Martin, and Connie Urquhart and Multicultural Programs for Tweens and Teens, edited by Linda B. Alexander and Nahyun Kwon. Order your copy today! After the jump, find out how you can win FREE BOOKS simply by registering for Teen Read Week, be a 2011 YALSA Emerging Leader, and more! For a limited time only at the ALA Online Store, if you buy a copy of YALSA’s Cool Teen Programs for under $100, edited by Jenine Lillian, or Excellence in Library Services to Young Adults, 5th edition, edited by Amy Alessio, you’ll receive a free copy of Excellence in Library Services to Young Adults, 4th edition, edited by Renee Vaillancourt McGrath. All three books offer the examples of high-quality programming, submitted by YALSA members and YA librarians and public and school libraries across the country. Both editions of Excellence were sponsored by the Margaret A. Edwards Trust and honored the best 25 programs for teens across the country. Cool Teen Programs highlights high-quality programs for libraries that cost less than $100, with tips for adjusting the programs to your budget needs (categories include no money, some money, and lots of money). Cool Teen Programs also includes helpful chapters on budgeting and marketing for youth librarians. This offer is only available at the ALA Online Store (you won’t be able to take advantage of it at the ALA Store in DC), so be sure to order your copy of Excellence 5 or Cool Teen Programs today! By Stephanie Kuenn December 2, 2009 December 2, 2009 YALSA Info. YALSA today announced the five titles for the 2010 Morris Award shortlist. YALSA will name the Morris Award winner at the Youth Media Awards in Boston at ALA’s Midwinter Meeting on Jan. 18. YALSA will also honor the winning title, as well as Morris shortlist titles and YALSA Nonfiction Award winners at a reception on Monday, Jan. 18 from 8-10 p.m. at Westin Copley Place Essex Center South. The William C. Morris Award honors a book written for teens by a previously unpublished author. More information on the finalists and the award can be found at www.ala.org/morris. Members of the 2010 William C. Morris Award are: Chair Judy Nelson, Pierce County Library System, Tacoma, Wash.; Jeana Actkinson, Bridgeport (Texas) High School; Dr. Joni Richards Bodart, School of Library and Information Science-San Jose (Calif.) State University; Susan Fichtelberg, Public Library of Woodbridge, N.J.; Angela Frederick, Nashville (Tenn.) Public Library; Clio Hathaway, Martin Memorial Library, York, Pa.; Melanie Koss, Northern Illinois University, DeKalb, Ill.; Anne Leon, Alvin Sherman Library-Nova Southeastern University, Fort Lauderdale, Fla.; Gail Zachariah, Keene (N.H.) Public Library; David Durante, administrative assistant, Pierce County Library System, Graham, Wash.; and Booklist Consultant, Ilene Cooper, Chicago. 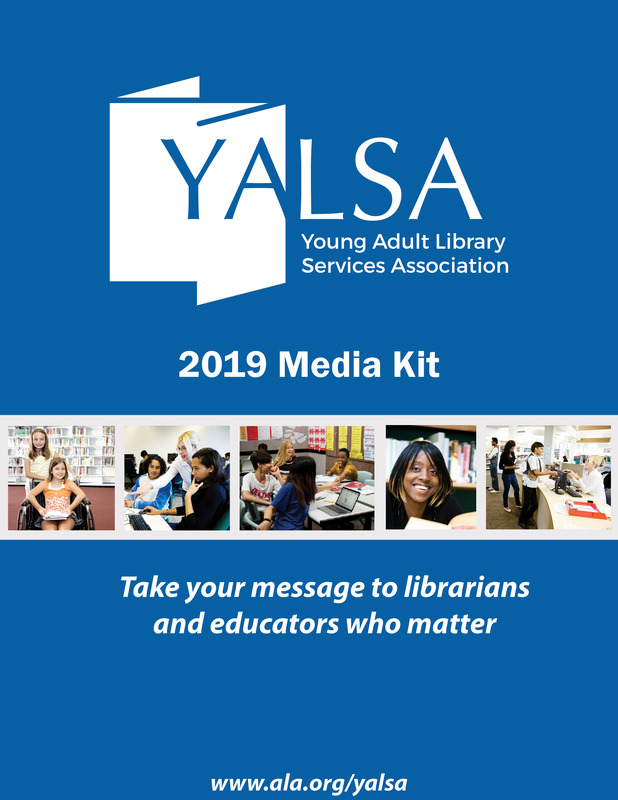 You know all about the $35,000+ in awards and grants that YALSA gives to members and that you can nominate books for YALSA’s literary and media awards. But ALA has many other awards and grant opportunities. After the jump, learn more about a few opportunities that are right up the youth services alley.